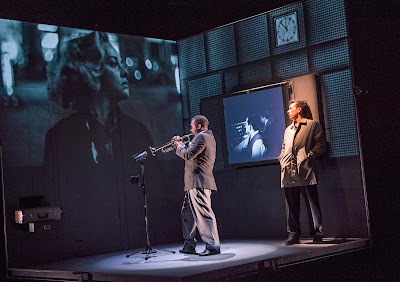 Wellesley Robertson III (left) and Olivier Normand in Needles and Opium. Photo by Tristram Kento. Bebop was music for your ears, not your dancing feet. In contrast to the Dixieland style (popularized by swing bands during the 1930s), bebop was built on polyphony (each member of the ensemble is melodically, harmonically, and rhythmically independent from the others). As a result, the style was dominated by virtuoso players like Charlie Parker (saxophonist), Dizzy Gillespie (trumpet), and Thelonious Monk (piano). For those two weeks in Paris, Davis was treated like a god. But when he returned to New York City two weeks later, he was brought down to earth with a jolt. There was no work to be had. Depressed and frustrated, he turned to heroin as a distraction. His creativity deserted him, and he became too sick to play. Only after Davis kicked his habit cold turkey did his creativity return. In the years following his recovery (1954–57), he formed a new quintet and recorded 22 albums, including Miles Davis All Stars Volumes 1 and 2 (1955), Walkin’ (1957), and ’Round About Midnight (1957). Led by the unique lyrical, smoldering, metallic quality of Davis’s trumpet with his stemless Harmon mute, Davis’s quintet—trumpet, tenor saxophone, piano, bass, and drums—became the pinnacle of the jazz movement at the time. 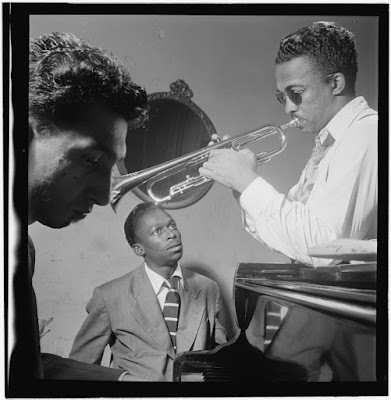 Miles Davis and Howard McGhee, September 1947. By William P. Gottleib. In 1957, Davis returned to Paris as a jazz musician celebrated on both sides of the Atlantic. At Orly Airport, he was greeted by film director Louis Malle, who wanted him to create the soundtrack for his latest film, Ascenseur pour l’échafaud (Elevator to the Gallows, 1958). Davis agreed. The soundtrack became the impetus for a new sound for Davis, one that would define the next ten years of his career and push jazz into new territory. Because Davis didn’t have time to rehearse with the group, he decided to create music based around a mode—a single scale—rather than chord progressions. This allowed the players to have more freedom in the melodic and harmonic lines. Back in the US, Davis continued to experiment with modes. Freed from the rigidity of chord progressions, he was able to leave more space in his solos, play fewer notes, and in a smaller range. It simplified his music, giving it an incredible emotional poignancy. Davis used this new sound for perhaps one of the most influential of his jazz albums, Kind of Blue (1959). This style became known as “cool” jazz. Needles and Opium opens March 30 and runs through April 23 at The Geary Theater. Click here to purchase tickets through our website. Love Jazz? Join us on April 13th and 20th for Jazz in Fred’s Bar after the show! Music artist Jessica Lá Rel will be performing.